One of our favorite beach towns also boasts one of our favorite beaches – Oval Beach. This beach has been ranked by Conde Naste traveler as one of the 25th best beaches in the world and by MTV as one of the 5 most beautiful beaches in the U.S.! But we like it for the little things. 4. Swing sets, concession stand, restrooms and picnic table with bbq grills are on a wooden deck south of the bluff. Also, we love getting to Oval Beach. Our favorite way is by taking the hand chain ferry across the Kalamazoo River. This ferry is a one of a kind on the great lakes and is great fun for kids and adults alike. Once over the river climb the nearly 300 steps up Mount Baldhead and you will be just one dune run away from the beach. But driving over can be good as well. A tree lined street and large parking lots make the drive more enjoyable. 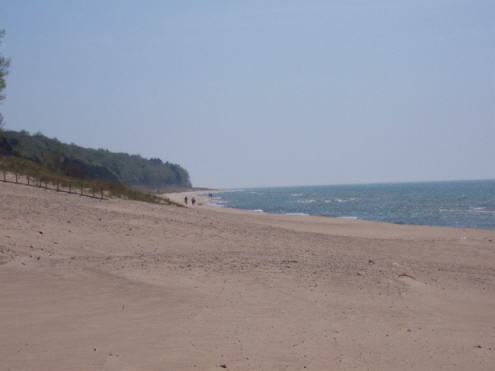 The beach is located on Oval Beach, RD, Saugatuck, MI. The Ferry is open July-Aug, Mon-Fri 11am – 8 pm, Sat – Sun, holidays 9am – 9pm. Make sure you experience the ferry as well as the beach. These are some of the reasons a Saugatuck rental is worth the money (if you can get in)! Check out the Lake Michigan Rentals Available.